The Kamuela Inn is a charming 30-room boutique hotel. It is centrally located in Waimea, set back from Kawaihae Road, in a relaxing and peaceful location. The new owners, Tim Bostock and Melanie Holt purchased the property two years ago and have been undergoing a series of upgrades and renovations.  They have incorporated the paniolo (cowboy) style of Waimea and used contemporary touches such as art by local artists, barn doors, and exposed wood features. The Kamuela Inn includes many different types of rooms. Some have a fully-equipped kitchen or kitchenette, two are executive suites, plus there are deluxe, standard and ADA accessible rooms. Each room is very comfortable, with all rooms having new beds and linens. Prices for all rooms include a continental breakfast, free parking, and WiFi. Coin operated laundry facilities are also available. Mel and Tim had never worked in the hospitality industry before, but both share a love of travel and feel strongly about the beauty and people of Waimea. “We feel that travelers to this part of the island are looking for a deeper connection to the island than a resort can offer.” Their usual guests include local families, alumni, small convention groups, and active travelers such as cyclists or hunters. The Kamuela Inn is also very popular among Australian and European guests. The main challenge of the inn has been trying to run it as “business as usual” during the upgrades. It is always their goal to make sure that guests have a relaxing and comfortable stay during their visit. Their greatest asset is their staff, particularly their innkeeper Edlyn Carvalho who goes above and beyond to make sure everything runs smoothly. “We are blessed to have such a hard-working and honest staff who know the town and are happy to share their aloha and knowledge with the guests,” said Melanie. The Kamuela Inn is especially suitable for weddings and parties. Large groups can rent out the entire facility and there is room on the newly improved front lawn for a large tent. In the future, Melanie and Tim plan to create a library, large meeting room, commercial kitchen, and bar. While there may be other places to stay in Waimea, none have the appeal of the quaint Kamuela Inn. They also offer a discount to Ke Ola Magazine readers—enter KEOLA when you book your reservation!